1)Pestilence is a death metal band from Enschede, The Netherlands founded in 1986. Later they incorporated more jazz and fusion elements into their music. They released four albums before disbanding in order to pursue other musical directions in 1994. Pestilence reformed in 2008 and released their album 'Resurrection Macabre' a year later in March. In late April 2011, the band released 'Doctrine'. Pestilence started in the Netherlands in mid 1986 as a thrash metal band. 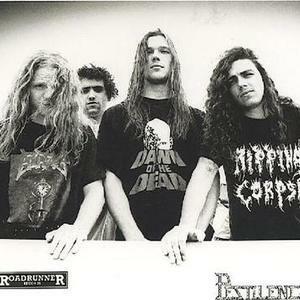 The lineup, consisting of Patrick Mameli (guitar, vocals), Randy Meinhard (guitar), and Marco Foddis (drums), recorded two demos before gaining the attention of Roadrunner Records. After the first demo, Martin van Drunen (bass, vocals) joined them. These two demos - Dysentery (1986) and The Penance (1987) - are raw, sounding mostly like a cross between Possessed and Schizophrenia-era Sepultura. After signing to Roadrunner Records, Pestilence released their debut album titled Malleus Maleficarum in 1988, further refining their approach to thrash metal. The new material was tighter and more focused than the demos. Shortly thereafter, guitarist Randy Meinhard left the band to pursue other musical goals in a new band named Sacrosanct. Meanwhile, Pestilence recruited a new guitar player by the name of Patrick Uterwijk. In 1989, the band released their second album Consuming Impulse, which was a turn toward to death metal. From a musical standpoint, things became heavier and more haunting. Vocally, Martin van Drunen moved away from cleaner vocals in favour of a more acidic growl. With its release, Pestilence gained international attention, highly regarded worldwide by death metal fans. But before a follow-up album was released, the lineup changed once again; vocalist and bassist Martin van Drunen departed to front Asphyx. Pestilence were faced again with the challenge of replacing a member, being without a vocalist and bassist. So while recording their third album Testimony Of The Ancients (1991), they enlisted bassist Tony Choy, who at the time was playing with the technical death metal band Cynic and Patrick Mameli took over the vocal duties. With this lineup, they released the album Testimony Of The Ancients. The new material was not as abrasive as the previous albums, but the band's musicianship has obviously grown and the album had the best production job of the band's catalogue. However, Tony Choy was never a permanent member, and ended up going back to Florida to eventually play with Atheist. In the meantime, Pestilence enlisted the talents of Jeroen Paul Thesseling (Obscura). Over the years, the Pestilence members were getting into other forms of music, primarily jazz fusion which, the band wanted to pair with metal. The band's fourth and final album, Spheres was released in 1993. With every album, Pestilence went through some kind of a change and Spheres was no exception. Pestilence mixed jazz fusion elements into their death metal style, and used guitar synths throughout the album. Pestilence's popularity had risen with the release of each album, but unfortunately, so did tensions between the members. So after a short period of time, the band unanimously decided to split up, feeling they had reached their creative climax. In 1994, Roadrunner released one last CD from Pestilence: a best-of titled Mind Reflections, containing tracks from all four albums, plus the rare song "Hatred Within" (originally released on the Teutonic Invasion Part II compilation) and six unreleased live tracks recorded in at the Dynamo Open Air Festival in 1992. In 1998, Displeased Records re-released the debut album Malleus Maleficarum (which was originally never officially released in Europe), and included both demo recordings from 1986 and 1987. In 2006, Metal War Productions, working with Martin van Drunen, released Chronicles of the Scourge, containing two concert recordings and one unreleased bonus track. The two concerts are Live "Kix Festival" - Veghel, Holland (June 24, 1989) and Live Bochum, Germany (November 18, 1988). A bonus "rehearsal disc" was released with the first 1000 copies. The band reformed in 2008. The new line up: founder Patrick Mameli (vocals, guitar), well known Tony Choy (bass) and drummer Peter Wildoer (Darkane, Non-Human Level and others). Their fifth album 'Resurrection Macabre' was released on the 16th of March 2009. In October 2009, Jeroen Paul Thesseling re-joined Pestilence after fifteen years of separation from the band, replacing Tony Choy's bass position. However, Thesseling has maintained that he will remain the bassist of Obscura as well. 2) Not the Pestilence most of know from Holland. This Pestilence was from Las vegas Nevada and also played some excellent death-thrash. This is their 1987 demo "Infected" http://www.mediafire.com/?ddykuu22bleyql7. Band changed name to The Horde of Torment.